Our creamy patés from the sea bring flavour to both breakfast and banquet. Tuna paté garnished with lemon balm makes a delightfully simple hors d’oeuvre. Boiled eggs, halved and topped with cod roe paté, are deliciously filling fare for the perfect picnic. And a few tablespoons of salmon paté will enrich cold sauces to savoury salty fullness. 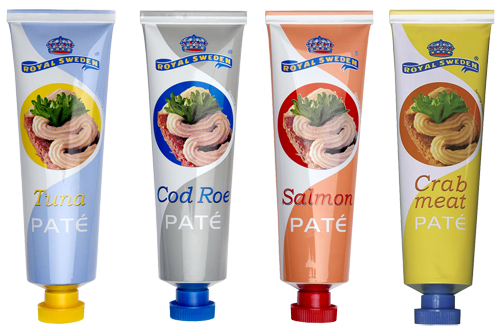 Fish Patés in tubes are the ultimate in “good-to-have-on-hand” food. Each and every member of the family can have his or her own favourite flavour, ready to enjoy right out of the fridge. In Scandinavia, we love to squeeze a curl of paté on our breakfast egg or open sandwich for instance – not only tasty but pleasing to the eye as well. Our fish patés are wholesome food, too. Our main ingredients like salmon and tuna are rich in nutritious polyunsaturated fats.